Asian stock markets jumped Monday as upbeat comments from the Federal Reserve's chairman and signs the U.S. housing industry was healing strengthened confidence in a global recovery. Tokyo shares helped lead the way with a 3 percent gain as the region, taking cues from Wall Street closing Friday at its highest since November, staged a broad-based come back from last week's heavy selling. Oil prices rose above $74 a barrel and the dollar climbed against the yen. 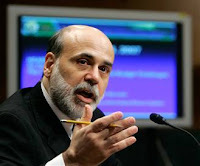 Investors poured into stocks after Fed Chairman Ben Bernanke said the prospects for a near-term recovery in the world's largest economy appeared to be good. Also boosting confidence was a better-than-expected rise in U.S. home sales last month that helped relieve some of the fears about American consumers that have held stock markets down lately. There was evidence of economic renewal in Asia as well. Thailand's economy emerged from recession in the second quarter thanks to increased government spending and manufacturing resuming growth after steep declines. "The numbers coming through continue to show economies are in better shape," said Song Seng Wun, economist at CIMB-GK research in Singapore. "But we could see more up and down in the markets as investors keep looking over their shoulder and asking themselves how much optimism is justified." Japan's Nikkei 225 stock average gained 305.76 points, or 3 percent, to 10,543.94. In China, the main Shanghai index was up for a third straight day, gaining 0.7 percent to 2,980.35, after its steep declines last week helped trigger selling around the world. Hong Kong's Hang Seng added 1.9 percent to 20,589.97. South Korea's Kospi advanced 1.8 percent, Taiwan's index jumped 2.8 percent and Australia's benchmark was 2.8 percent higher. Thailand shares rose by 1.8 percent. Wall Street finished the week on a high note, with the Dow up 155.91, or 1.7 percent, to 9,505.96, closing above 9,500 for the first time since Nov. 4. The Standard & Poor's 500 index rose 18.76, or 1.9 percent, to 1,026.13, its highest close since Oct. 6. And the Nasdaq composite index rose 31.68, or 1.6 percent, to 2,020.90, reaching its highest close since Oct. 1. Oil prices rose amid the brightening outlook for global demand. Crude for October delivery climbed 25 cents to $74.14 a barrel in Asian trade. The contract was up 98 cents on Friday. The dollar rose to 94.80 yen compared to 94.38 yen, and the euro weakened to $1.4326 from $1.4341.